Island Table / breakfast bar. Add interest and pizzazz to your Mexican lifestyle with this super-cool breakfast bar that offers great storage and wind rack. Add interest and pizzazz to your Mexican lifestyle with this super cool breakfast bar. Later on, if you are entertaining, use it for additional seating, wine and hors d'oeuvres. 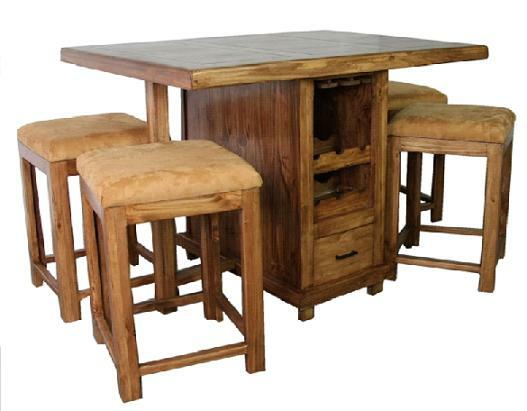 Set includes island table and 4 breakfast stools upholstered in 'Sand' color suede. This is a great piece for those who need space saving ideas. Lots of great storage and wine rack. Perfect for condos and smaller kitchens.